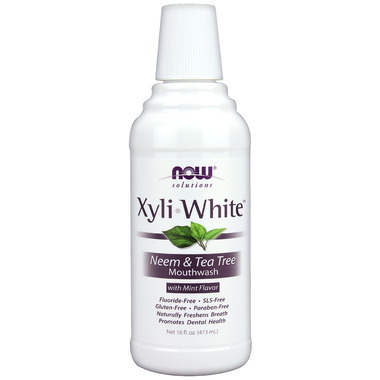 NOW Solutions Xyliwhite Neem & Tea Tree Mouthwash is effective dental care without the use of fluoride. This is an effective fluoride-free oral rinse that works in unique ways to help you achieve a smile that's healthier and brighter than ever before! XyliWhite Mouthwash gets its cleansing properties from xylitol - a naturally occurring sugar alcohol that has been shown in clinical studies to help promote dental health; effectively rinsing debris, such as food particles containing bacteria from mouth surfaces. Xylitol also helps safeguard healthy tooth enamel surfaces. By preventing the mouth's pH levels from falling below their normal range, XyliWhite Mouthwash protects the enamel surface of teeth. Neem and Tea Tree are combined in this mouthwash to provide gentle relief for people requiring additional oral care assistance. Directions: Shake gently before using. It is recommended that you first brush with XyliWhite Whitening Toothpaste and then rinse mouth for at least 30 seconds with XyliWhite Mouthwash. Ingredients: Water (Aqua), Aloe Barbadensis Leaf Juice*, Xylitol, Glycerin, Glycerin and Ethyl Lauroyl Arginate HCl, Polyglyceryl-10 Laurate, Natural Essential Oil flavour Blend [Mentha Piperita (Peppermint) Oil, Melaleuca Alternifolia (Tea Tree) Leaf Oil, Thymus Vulgaris (Thyme) Oil, Mentha Spicata (Spearmint) Oil, Eucalyptus Globulus (Eucalyptus) Leaf Oil, Gaultheria Procumbens (Wintergreen) Leaf Oil, Eugenia Caryophyllus (Clove) Leaf Oil, Menthol, Illicium Verum (Anise) Seed Oil], Hamamelis Virginiana (Witch Hazel) Extract, Sea Salt, Melia Azadirachta (Neem) Oil, Citric Acid. Good product! Very refreshing. A very little goes a long way. This product is expensive but I feel it's worth it. One bottle will last me about a month. My dental hygienist says products with Xylitol are good for my teeth. I like the flavour as it's fresh and not overly strong. the product is of very good quality....I just have a problem with the strong taste...I mix it a bit with water...my teeth feel clean and soft. Love all the natural ingredients! The flavour takes some getting used to, but it's not strong or overpowering. Leaves my mouth fresh and clean!